Mobile advertising and ad optimization company Smaato has released its March figures on mobile ad click-through rates around the world, and some of its findings are quite surprising. 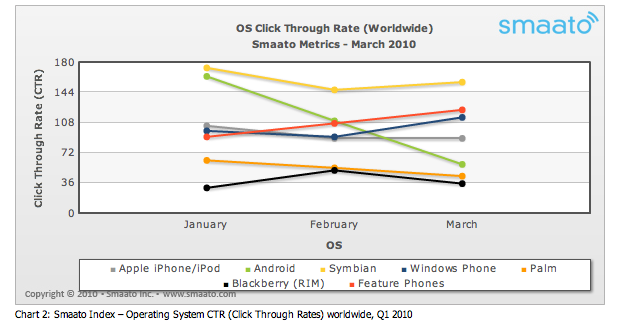 According to Smaato, Symbian still reigns supreme in its global OS click-through rate index, outshining feature phones (non-smartphones with a proprietary operating system), Windows Phones and Apple iPhone and iPod touch devices, in that order. Android, at the number 2 spot in both January and February 2010, has dropped by around 50% and into fifth place. The only operating systems with lower CTR are those of Palm and RIM (Blackberry). The index consists of the average click-through rates across all devices (set to 100). 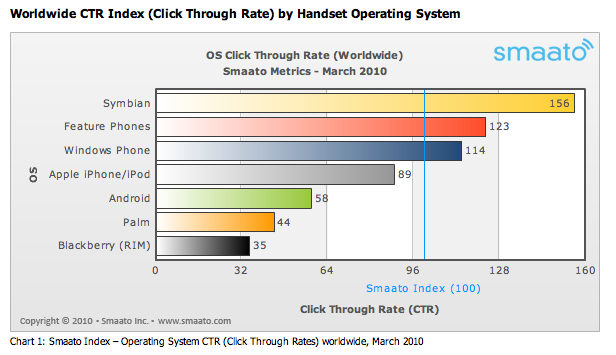 Smaato’s metrics are based upon 36 mobile ad networks and over 4 billion ad requests served in the Smaato Network of more than 3,300 registered mobile publishers in March 2010. According to its report, Android has dropped fast in the past few months on a global level, although it still “outshines competition” in terms of click-through rates in South East Asia. The biggest increased in mobile ad CTR actually come from feature phones and Windows Phones, which is upbeat news for the likes of Nokia and Microsoft. Symbian’s lead has shortened in the CTR Index table yet remains the OS to beat with regards to CTR performance in mobile advertising. Feature phones have been making steady ground ever since since the first Smaato Metrics Report was released in December 2009, whereas Apple has remained consistent across February and March.